Enjoying The Course: Road Rash Rocked Ragnar! The day after the Great River Ragnar, Jeff and I went scuba diving in Wazee Lake, and then it was back to work on Monday. It's actually been a really busy week, but I still wish I had taken the time to write this recap earlier. I saw an old friend from jr/sr high school post something random about running Ragnar Great River this year on her facebook page. 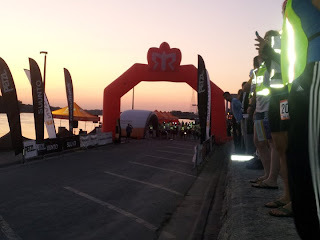 I'd only recently heard of this relay race and had looked over the website and was very interested in joining a team. Naturally, I zipped her a message asking for more details and if they had any more spots open. My confidence in my preparation waxed and waned throughout the following weeks. Two weekends before the race, I run a half marathon. 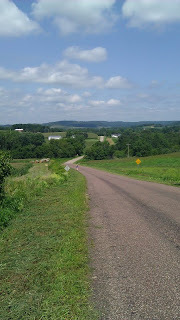 I thought, if I can run a half, certainly I can survive Ragnar. Then I looked at the Ragnar suggested training schedule. I wasn't prepared. Still....I CAN DO THIS! became my motto. We spent the beginning of the week up at Big Lake Wilderness Lodge north of Ely on a family vacation. I had all Thurs morning to pack, but I was lazy, so only after Jeff took off for his scuba class did I realize that we hadn't taken all the bags out of the car. The bag that remained had so much of my running gear - hat, belt, shot bloks, bug spray, sunscreen, etc. I had to get that bag! Thankfully, Bryce and Mike from my team were nice enough to pick me up and drive me to South Minneapolis to retrieve it. Jeff had stuffed it under the car - luckily it was still there! 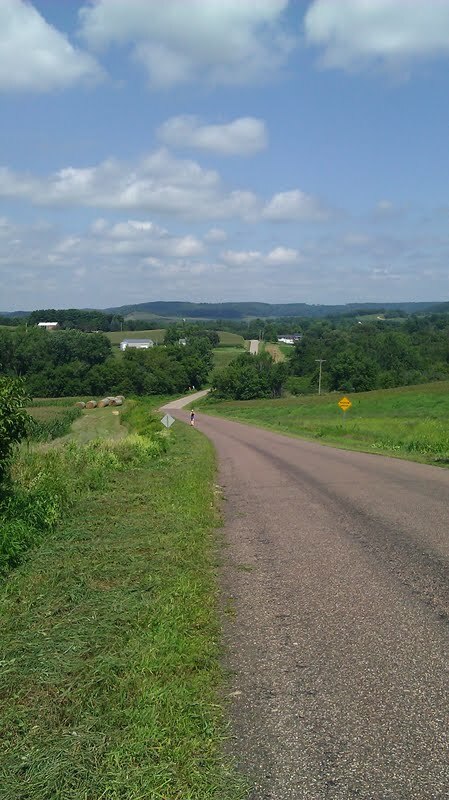 We headed back to St Paul to meet up with the van and begin the journey down to Winona, MN. Since we had a 6:00am start time and a 5:00am safety briefing, we decided to get a couple hotel rooms for the night. Despite that, 4:00am came super early! Of course, being the last runner in my van, I had hours to go before my feet would hit the pavement runnning. It was a cool, beautiful morning! It certainly did heat up by the afternoon, though! Andrea and I got the worst of it during our first legs (okay, well, not nearly as bad as van 2. sorry guys!) plus the hills just about killed me! I ended up walking a LOT more than I'd wanted to during my first leg, but its completion meant a break for van 1. While van 2 ran their first legs, we found a park in Pepin, WI, where we ate lunch. We also found a public beach which was actually closed, but we pretended not to notice the small handwritten sign on Lake Pepin (i.e. the Mississippi River) where we swam lounged in the water to cool off and to rinse of the cake of dried sweat we were all sporting. 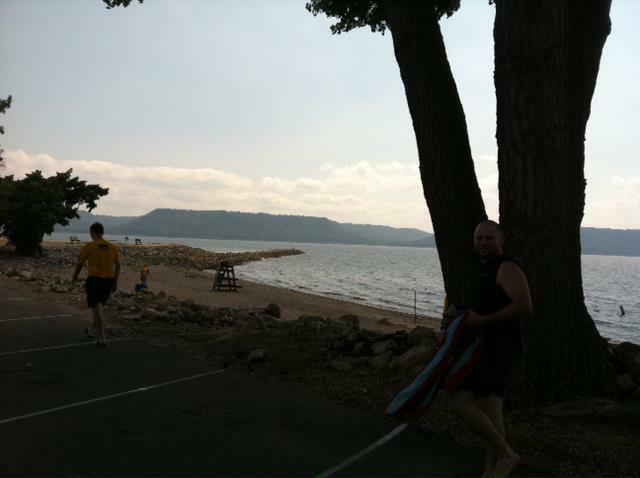 Lake Pepin - DONE with legs 1-6! My second leg started at roughly 11pm. I'd never really run in the dark before and never with a reflective vest and headlamp. It was a weird experience! I'd totally do it again, though. I ran with my own water bottle, so I didn't particularly need van support during this leg. I kind of thought my team was just going to meet me at the finish. I was listening to my music and concentrating on not tripping in the darkness, when I heard someone yell out "I love this song!" I refused to use headphones and just blared my music right from my running belt! Several steps later, it clicked that it wasn't just some random person yelling that out...it was my team. Unfortunately, they didn't recognize me. What?! All runners with the reflective vests and headlamps look the same?! :-) I kept looking at all the passing vans to see the one that said Road Rash. When I saw the One Mile To Go sign, I still hadn't seen them pass me by, so I figured I should try giving Andrea a call. No answer. Sent a text that said something like You at exchange? I've got less than 1 mile to go. Good thing I was passing off to the next van! This exchange was the most complicated for me. This could be due to the dark, but I had a difficult time figuring out which way to go and where to go. Thank goodness for a couple of teens randomly sitting on a busstop bench that corrected my wrong turn! After the exchange, I texted Andrea again to say I would meet them where the vans entered this particular exchange. I found them with no problems whatsoever. And we were off to Exchange 24 where there was promise of indoor showers and sleeping. It was a junior high school. So, yeah, the showers sucked just as much as you could imagine. Apparently, I had no problem sleeping on the gym floor, though. I slept soundly from about 1:30 to 3:30 when I got so cold I had to actually get inside my sleeping bag. I quickly fell back asleep until 5:07 when I heard my teammates rustling to pack up their stuff. Runner 1 would be starting us off again soon. My tummy wasn't too pleased with me as my leg was approaching, and I did not really feel up to running another leg, but I did it. I was actually able to stick to my 10/1 intervals, too for the most part! The running got easier as I went along, and I actually did end up enjoying this leg. Towards the end, but before the 1 Mile To Go sign, another runner came up behind me and asked if I wanted to run with her for a bit. I declined. She was just a tad too fast for me, plus I was set to do a walk break right when she asked. The end of my third leg came with mixed emotions for me. I was glad to be finished running but not so much looking forward to waiting the 5 hours for van 2 to finish. We headed straight to the finish to wait for our teammates. The after-party was in full swing - and the beer and pizza consumption began. If I drank beer, this might have been fun - and certainly would have made the time go faster. Finally, we saw our last runner coming down the path along the river. We all ran to meet him, so we could cross the finish together. GO TEAM ROAD RASH! We pretty much finished right on target! Definitely it was physically challenging but also so much fun! I was surprisingly able to finish each of my legs really strong - which is, ultimately, always my goal of any race. It was fun to run and make some new friends, but it was also really fun to see the creativity of all the other teams - from the team names to the costumes to the van decorating. There was just a lot of fun energy surrounding this race! I think most, if not all, of Road Rash hopes to do this again next year. Sadly, I won't be able to join them because I'll just be settling into life in St Thomas. Perhaps Ragnar Florida Keys in Jan 2013... Who's in?? You do make it sound like a really awesome and fun time! I'm glad you had a blast! Wow! I am very impressed. Go Clarinda! Fantastic! There's a Rangar here in Washington that I would LOVE to do with a team one of these years! How totally fun for you! Just came across your blog today! Sounds like you had a blast. I need to get a team together and give it a shot. Christie, thanks for stopping by! 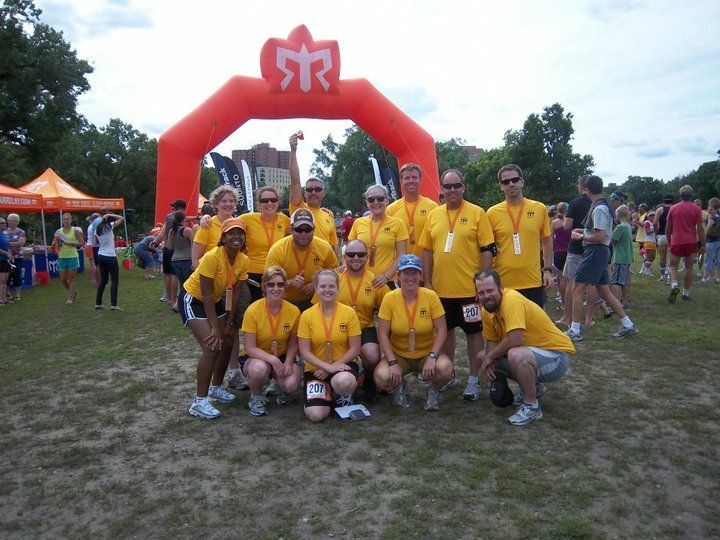 Ragnar was awesome, and you should totally try and get a team together.